This was the site of the Malaya Pavilion during the British Empire Exhibition, but all that remains when this photograph was taken is some of the structural steelwork, including that for the two large minarets. You can see these in this colour postcard image (from the Wembley History Society Collection at Brent Archives, and the statue of Sir Stamford Raffles which stood in front of the main entrance to the pavilion (Singapore was still treated as part of Malaya in the 1920's). 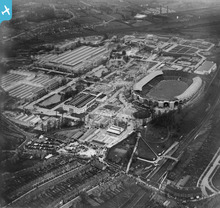 This area of the British Empire Exhibition site had been the Amusement Park in 1924 and (with some new attractions) in 1925. By the time of this photograph in 1927, the rides had all been sold off. Some found new homes in resorts such as Blackpool and Southend, but the rest ended up as scrap metal. Anyone interested in the story of the Exhibition can find an introductory history of it on the Brent Archives website at: http://www.brent.gov.uk/media/387533/The%20British%20Empire%20Exhibition.pdf . 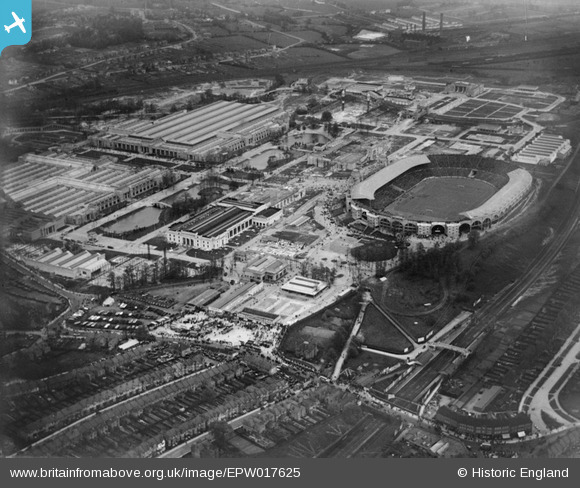 The online catalogue at the Brent Archives website will also give access to a large number of digitised photographs and postcards of the exhibition, many from the Wembley History Society Collection which is deposited there. Turning loop for the miniature railway. Scenes on the 'Never Stop Railway' can be seen at http://www.britishpathe.com/video/never-stop-railway The sloping and curved track in the moving pictures is in this area. 'Never Stop Railway' on viaduct.